This 48.4 AC tract is divided into 3 seperate parts with different ''Best Use'' and different prices. 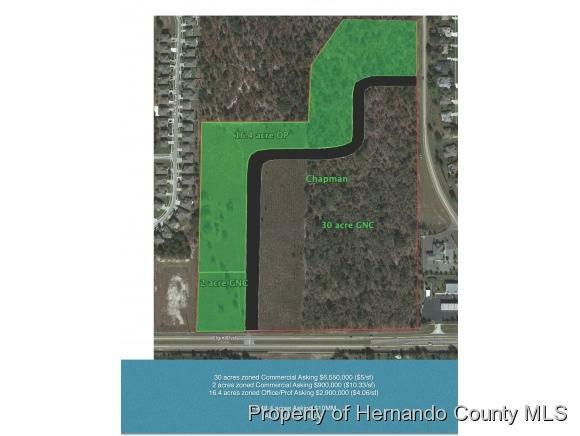 TRACT A: 2 AC Commercial (GNC) $900,000TRACT B: 16.4 AC Office/Professional (OP) $2,900,000TRACT C: 30 AC Commercial (GNC) $6,500,000 All utilities are available, bracketed by 2 public schools less than 1/2 mi on either side and surrounded by upper income residential developments. May be developed with a max of 395,000 SF leasable building space. Close to Veterans Exprswy and the signalized intersection of Elgin & Barclay.